The Hindus, Greek, Romans, Babylonians and Chinese all knew the value of licorice. 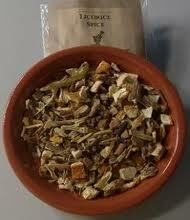 Licorice root has been used to relieve upper respiratory symptoms. This herbal medicine contains: anti-viral and anti-inflammatory properties. Licorice is used for soothing throats, bronchitis, indigestion, stomach ulcers, heartburn etc. This herb is best when it is taken as a tea. The technical name is Glycyrrhiza Glabra.